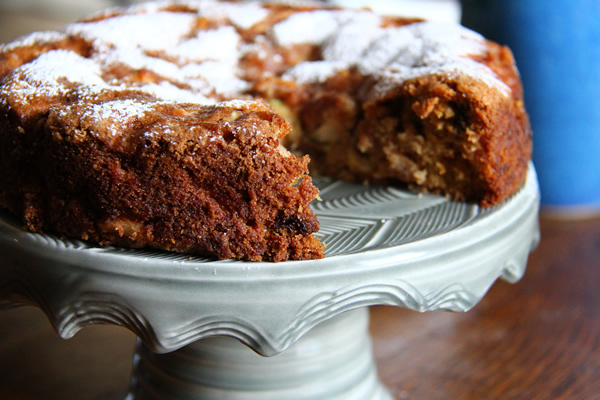 This cake’s versatility stems from its Jewish heritage. It purposely contains no dairy, so those who keep kosher can enjoy it any time, with meat or dairy meals. This recipephany comes from my earliest baking bible (Old Testament version), From Manna to Mousse. Born in 1969 as a plastic-spined fundraising cookbook produced by the Sisterhood of Congregation Beth El in New London, Connecticut, it became a nationally distributed Dell paperback in 1972. It contains family favorites covering all Jewish cookery, not just baking, and it’s even got a rabbi’s blessing. The book’s heirloom recipes are short, easy to follow, and reliable, thanks to rigorous kitchen-testing by the compulsive and close-knit Sisterhood. The chief editor, Mrs. Donald Daren, wrote that on testing days, “Diets were discarded with abandon, for who could not justify the fact that the chocolate whipped cream mousse just had to be tested along with the twenty-nine other delectable concoctions served that same afternoon!” The editors were dogged in their quest to capture authenticity. “Some of the traditional dishes were measured out while a balabusta cooked them. We stayed her hand over the pot so that exact quantities could be recorded,” she wrote. My college pal, Elinor Lipman, shared this cookbook when we roomed together after graduation. We both loved its recipes, and it soon became my baking security blanket. So when it came time to divide up our stuff and move on, I literally wrestled it away from her. I remember that moment with a combination of guilt and gratitude that seems curiously appropriate with a Jewish cookbook. So thank you, Ellie, for the book, and thank you, Mrs. Harry Kaplan, for this recipephany. And thank you, Robin Henschel, the acclaimed potter who created this astonishing cake stand. It makes every cake look—and I think taste—better. Grease an 8 x 8 x 1 ½-inch square pan or an 8 x 2-inch high round pan. For easy cake removal, line with greased wax paper. Combine diced apples and sugar in a large bowl and let stand 10 minutes. Using a spoon, mix oil, egg and vanilla into apple mixture. Add dry ingredients and mix well. Stir in raisins. Bake at 350 degrees for 35 to 40 minutes. Let cool, remove from pan and peel off wax paper. Optional: Dust with confectioner’s sugar just before serving. Can’t wait to try this! From Ellie Lipman, no less! Thank you, Szifra! We always made the square cake, which I think may bake up more evenly than the higher, round cake. Yes, it’s from your pal, too!